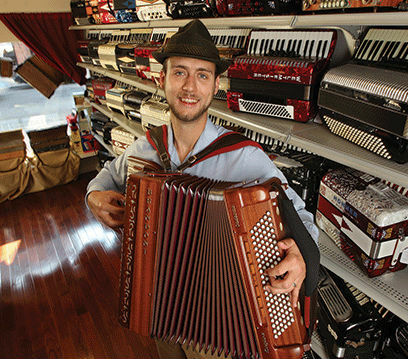 Owner Mike "Bellows" Bulboff was enamoured with the piano accordion ever since he discovered one in his father's attic. What started as a curious hobby led to repairing, teaching, and inevitably a life commitment to the instrument. Following his passion, Mike opened the original location in the historic Italian Market neighborhood of Philadelphia in 2009. In the years that followed, Mike realized that the future of the accordion depended on building a new generation of repair staff, making the instrument more accessible via the internet, and cultivating a community. 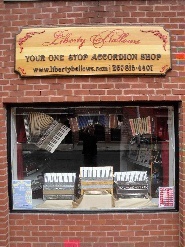 Liberty Bellows is committed to accordion so that it will thrive for many generations to come. We invite you to visit our new location at 614 S. 2nd St, Philadelphia, PA 19147. We are conveniently located a few minutes from I-95 and a short drive from the Philadelphia International Airport. There are always metered street parking spots available in front of the store. For those of you who are unable to visit our store, we are happy to ship accordions and accessories worldwide. Take a Virtual Tour of our Store on Google Maps! Job Description : We are seeking a full time paid summer intern to assist with day to day operations including shipping and receiving, online and in-store inventory, organization, data entry, and customer service.